Ok, so not strictly an SCCM related post but it might be helpful to many people struggling to setup IPsec. We have recently been asked to ensure that all our SCCM 2012 servers communicate with each other using IPsec. Now, anyone who has tried to do this, having never done it before, will know there isn’t that much online on how to do this. At first hand it seems quite complex but actually its pretty easy to do. Login with an admin account, open up Services and ensure the IKE and AuthIP IPsec Keying Modules service is running and set to start automatically. Open Windows Firewall with Advanced Security, right-click over Connection Security Rules node and select New Rule…. 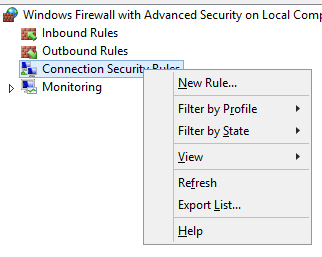 In the New Connection Security Rule Wizard, on the Rule Type page, select the Isolation radio button and click Next. On the Requirements page, select the Request authentication for inbound and outbound connections radio button and click Next. On the Authentication Method page, select the Computer (Kerberos V5) radio button and click Next. On the Profile page, leave as default and click Next. On the Name page, give the rule a sensible name and click Finish. That’s it! Now obviously you’ll want to test its working and I’m sure you can use some sort of network monitor to do this but the easiest way is to use the tools in the firewall itself. I recently had to start inventorying virtual apps in SCCM 2012 and although its very easy to do, I noticed there isn’t much out there explaining the process. How you do this will depend on whether you use App-V 4.6 or App-V 5. 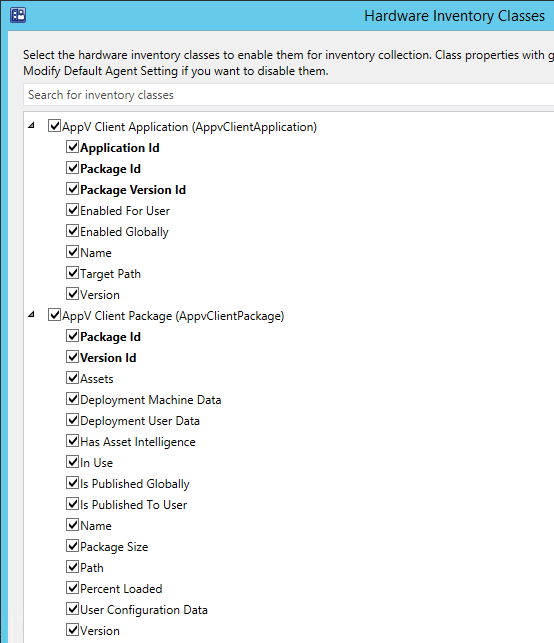 Once you have deployed an App-V 4.6 app to a machine the above WMI class should get populated. Then its just a simple case of going to Client Settings, Hardware Inventory, choose Set Classes and turn on the correct Classes for App-V 4.6, which are Virtual Application Packages (Package) and Virtual Applications (Application), selecting which ever values you need reporting back. 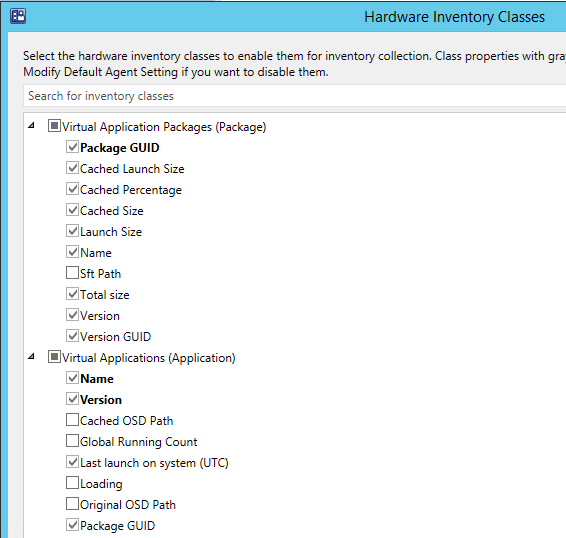 Once you have deployed an App-V 5.0 app to a machine the above WMI class should get populated. Then its just a simple case of going to Client Settings, Hardware Inventory, choose Set Classes and turn on the correct Classes for App-V 5.0, which are AppV Client Application (AppvClientApplication) and AppV Client Package (AppvClientPackage), selecting which ever values you need reporting back. Once the clients have updated their policy and ran a Hardware Inventory you can go to Resource Explorer > Hardware and you should see nodes for AppV Client Application, AppV Client Package, Virtual Application Packages and Virtual Applications, all showing virtual application data. I’ve been troubleshooting a number of SQL replication issues recently and found a couple of great blogs to help. I’ll continuously update this post to list great articles that will help you understand and troubleshoot DRS problems. Me and a colleague have been working on an issue today where the Hinv from a client was being generated and sent but never seemed to be received by the MP. When we checked the Last Hardware Scan value for the machine in Resource Explorer > Hardware > Workstation Status, we could see that SCCM stated the last scan was from over a month ago but looking at the InventoryAgent.log on the client, it clearly showed it successfully sent the report yesterday. There were no errors (or even mentions) for this machine in either of the inventory components in Component Status in the console or in the MP_Hinv.log on the MP. Something was blocking the report between it being sent by the client and it being received on the MP. For Windows 7 or Windows 8 go to C:\ProgramData\Microsoft\Network\Downloader. For Windows Vista and below go to C:\Documents and Settings\All Users\Application Data\Microsoft\Network\Downloader. Once the BITS queue had been cleared we ran another Hinv and the information was sent by the client and received by the MP successfully. The client also no longer created any errors in the IIS logs. Did you know it was possible to make SCCM think that a computer is in a particular AD site, even though based on its IP address, it is in a completely different one? You may want to use this for many scenarios such as a test environment, where you want to force a client to download from a particular DP. Create a new String Value called SiteName with a value of the AD Site you want to use. All software downloads initiated from this client will now take place from the DP that has the boundary for this AD site. Earlier today I was trying to create a collection that showed all machines that were in another collection.